​Strategising Intensive Engagement accompanies that tactical toolkit and places it in a strategic context for senior police managers. After a good deal of enthusiasm, neighbourhood policing is entering a period of a loss of confidence. There is sparse evidence of its effectiveness , the techniques used are sporadic and often untested. Approaches to engagement and problem solving that do appear to yield results are often overlooked or judged ineffective through failed implementation. (Quinton and Morris 2008). Neighbourhood policing is marked by officers trying to deal with very large demands for response, covering everything from low grade loitering on streets to domestic violence, FGM and radicalisation. ​Strategic approaches to neighbourhood policing has been limited to increased visibility (creating more work), thematic approaches such as a week of action on drugs, followed by a week of action on radicalisation as if a)they are not connected and b) a week is sufficient to gain traction on a problem. Senior officers are often held to account by weekly performance reviews, leading to a focus on micro-patterns of crime and policing activity, and a loss of focus on the conditions that lead to the crime patterns. In recent years, there have been some improvements, with more forces using indices of vulnerability, demand data and harm indices to manage individual activities. There have been few examples of a strategic and systematic approach to managing different neighbourhoods within a command area. Whilst vulnerability and demand data is becoming more frequently available to neighbourhood commanders, there is very little guidance on the implications of the data. 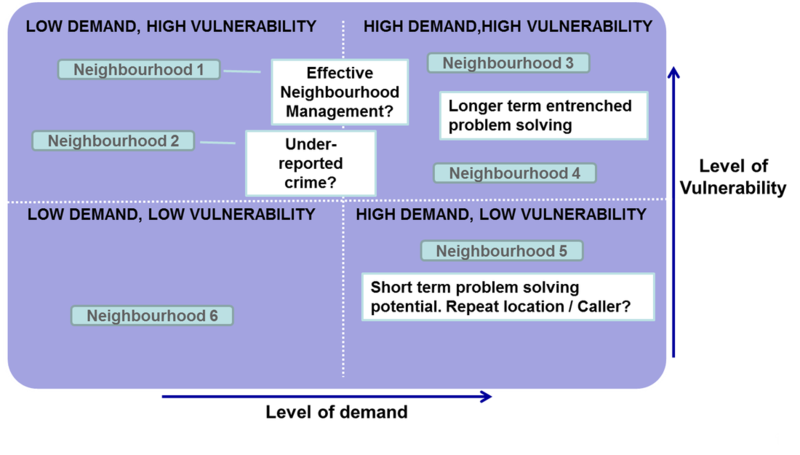 This paper describes the use of demand and vulnerability data to develop strategic options for different neighbourhoods within a given command area. The Intensive Engagement toolkit has been designed to respond to and correct the weaknesses in current neighbourhood management, as well as enhance and secure tactics that are effective.